The University of Toledo is bringing electric scooters to campus. Beginning fall semester, the University will launch its electric scooter sharing program through a company called Lime. Natalie Watson, a junior social media specialist in University Communications, took an electric scooter for a test ride on Centennial Mall. More than 100 battery-powered scooters will be available for students, faculty and staff to rent through a smartphone app starting fall semester. UT is debuting the green, alternative transportation service to benefit students, faculty and staff. UT is starting with 125 electric scooters and plans to double that depending on demand. 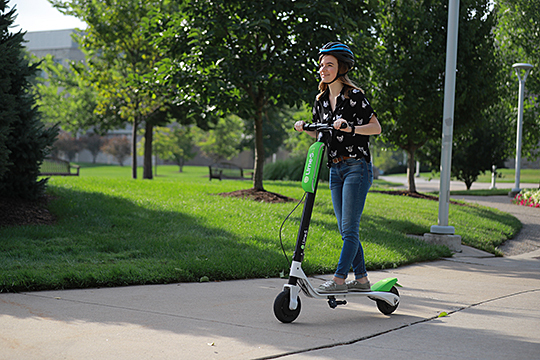 The battery-powered scooters will be located at multiple “hot spots” across the University’s Main Campus, with users locating and unlocking them through the free Lime app. After reaching their destination, riders then lock the scooter with the app. Users are charged $1 by Lime to unlock a scooter, plus 15 cents per minute. The Lime app shows real-time scooter locations, making it easy for users to find a scooter throughout campus. Every evening, all scooters will be collected by Lime, fully charged, and returned to their original hot spots for use the next day. The 250-watt motored scooters, which have a maximum speed up to approximately 14.8 miles per hour and are equipped with safety features, will be limited to on-campus use only. Read more about the scooters here. This entry was posted on Thursday, August 2nd, 2018 at 10:21 am and is filed under News, UToday .